New Delhi: Bharti Airtel Ltd will focus on premium customers and expand its broadband service across India’s top 100 cities, instead of copying Reliance Jio Infocomm Ltd’s ambitious plan to create a fibre-optic network across the country. The New Delhi-based telecom operator’s fibre-based broadband internet strategy is akin to what it has recently announced for its wireless customers, wherein it will only hold onto users who spend at least ₹ 35 a month on recharges, so that the network experience improves for all customers. “Airtel’s plan is clear...to stay focused on the top 100 cities... stay focused on the high income, stay focused on high-rise buildings rather than horizontal deployment, as this business model is more economical and logical," a person with direct knowledge of the matter said on condition of anonymity. The commercial launch of Reliance Jio GigaFiber is expected to disrupt the wired broadband market in a similar way it disrupted the wireless market. Reliance Jio has launched the registration process for Jio GigaFiber with an aim to connect 50 million homes but has not announced the pricing plans yet. Reliance Jio GigaFiber would also be the largest greenfield fixed-line broadband rollout globally, with simultaneous introduction in 1,100 cities across India, which would connect homes, merchants, small and medium enterprises and large enterprises, Reliance Industries Ltd chairman Mukesh Ambani said in July. Airtel, on the other hand, plans to cater to better-paying customers and aggressively expand this market. It has 2.2 million wired broadband customers as of 30 September. According to data available with the Telecom Regulatory Authority of India (Trai), there are 18 million wired broadband subscribers in the country. Reliance Jio has not yet commercially rolled out its broadband service. “As long as it is the mid- to high-end of the market, Airtel will compete there very hard and match any prices offered by rivals," the person cited earlier said. “Two years ago, the company used to do half-a-million home passes every year. Last year it did one-and-a-half-million home passes. In 2018-19, Airtel is deploying 2.5 million home passes. In the next few years, the plan is to end up doing 8-10 million home passes. It already has 10 million home passes. This will make that a total of 20 million." In the wired internet segment, fibre is distributed to homes via an optical distribution frame, with a single fibre dedicated to each customer’s home, which is termed a home pass. This pass may or may not result in conversion of a customer. Airtel believes that catering to the upper segment would be prudent as home broadband is a costly exercise and also requires more committed spending from the customer compared with a wireless subscriber and hence the company should focus on ensuring that consumption goes up. 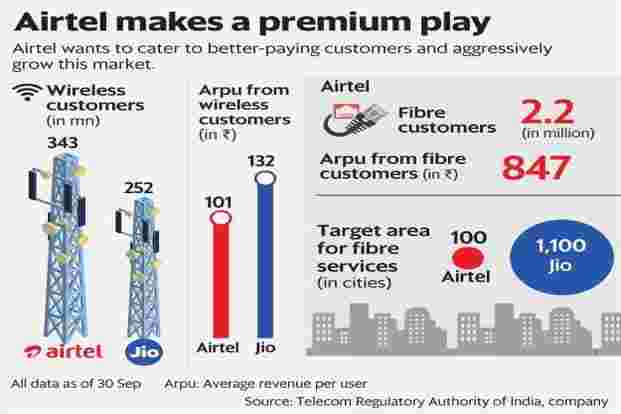 “Given that deployment of fibre is time-consuming and expensive, Airtel’s strategy to focus on the high-end consumers makes sense as it will generate healthier cash flows. It seems wise for the company to not invest heavily in areas where returns are going to be too far away in the long run," said Mahesh Uppal, director at communications consulting firm ComFirst India. To ensure customer stickiness, Airtel also plans to build a digital platform, Airtel Homes Platform, wherein it will offer bundled services. “There is an overlap of mobile and home broadband customers, as well as those who use DTH services. So the company is now creating propositions, whereby the customer benefits if he takes all three services," the person cited earlier said. “The billing is also integrated and will offer discounts. Airtel is also currently piloting in Andhra Pradesh the Airtel Homes Platform, whereby a customer can buy all three (broadband, DTH, SIM card) together." The platform will also offer not just products from Airtel’s stable, but also ancillary services such as home security and surveillance available through a third-party vendor, but serviced by Airtel. A spokesperson for Airtel declined to comment.